February to showcase its star attraction. Roland Pro 4 with Sign+Digital staffAfter the very successful launch of the Roland Pro 4 XR-640 in October of last year, Dublin based Roland Distributor, Sign+Digital has announced a nationwide road show during February where the Roland SolJet Pro 4 XR-640 will be the star attraction. The company said that this will be a great opportunity for those keen to see the Pro 4 in action and to learn more about the latest large format print and finishing equipment currently available in the Irish market. Roland’s Pro 4 is the next generation of SolJet. Unique features include a new, advanced Eco-Sol Max 2 ink technology including a light black, high-opacity white and fast-drying metallic silver. The XR-640 also includes the latest version of Roland’s powerful RIP software - VersaWorks, which now features Pantone® spot colour replacement. Boasting an impressive print speed of 49.1 m2/hr, the XR-640 can produce a wide variety of applications including vibrant wide format banners, signs, posters, vehicle graphics, labels, decals, POS displays and many more. 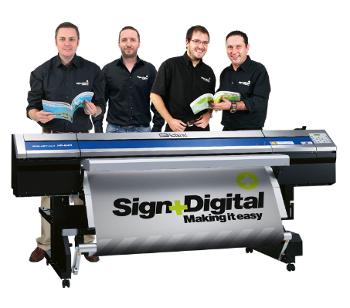 At the event Sign+Digital will also be introducing its new range of Easymount wide format laminators from Vivid. Starting at just €1,799, the Easymount range has been introduced to offer a number of affordable options for every size sign shop. Other machines available for demonstration on the day will include the Roland VersaCAMM VS-540, which is now available with double white ink and the Roland SP-540i which is the entry level print and cut model suited to commercial printers and graphics companies looking to enter the wide format market. Due to the success of their recently opened tool shop dedicated to sign makers and digital printers, Sign+Digital have launched a mobile version of the tool shop aptly named the Creative Cruiser. The road show will also mark the inaugural voyage of the Creative Cruiser in Ireland which is jam packed with all the best tools of the trade.